What to post though? There are sooo many things out there that tempt me, call to me, beg to be shown. *Long hours to spend wandering aimlessly though a bookstore and/or library. *Paranormal books, movies, TV shows - the stranger the better! *Eyes - filled with so much emotion and all different. *Shoulders - sturdy and strong affording the loves of his life protection. That's just a few of the things that tempt this lady. What about ya'll, what tempts you? 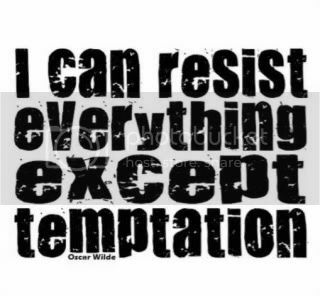 What tempts me... a whole lot!!! The loving eyes of my doggies, are one of the best temptations. Though, they don't always get treats, just lots of kisses and woggling hugs.